It was the bloodiest single day for Palestinians since 2014. Palestinian demonstrators run for cover during a protest against U.S. embassy move to Jerusalem and ahead of the 70th anniversary of Nakba, at the Israel-Gaza border in the southern Gaza Strip on May 14, 2018. GAZA/JERUSALEM (Reuters) — Israeli troops shot dead dozens of Palestinian protesters on the Gaza border on Monday when the high-profile opening of the U.S. embassy to Israel in Jerusalem by the Trump administration raised tension to boiling point after weeks of demonstrations. The bloodshed drew calls for restraint from some countries, including France and Britain, and stronger criticism from others, with regional power Turkey calling it "a massacre." The White House declined to join in urging Israel to exercise caution and pinned the blame squarely on Gaza's ruling Hamas group, backing Prime Minister Benjamin Netanyahu who described the Israeli military's actions as self-defence of his country's borders. Israeli Prime Minister Benjamin Netanyahu, his wife Sara Netanyahu and Senior White House Advisers Jared Kushner and Ivanka Trump applaud during the dedication ceremony of the new U.S. embassy in Jerusalem, on May 14, 2018. Netanyahu thanked Trump for "having the courage to keep your promises." U.S. Senator Tim Kaine, the top Democrat on the foreign relations subcommittee that covers the region, told Reuters the situation was "tragic" and said, "It's not viewed as the U.S. trying to solve a problem, it's viewed as the U.S. just stepping away from the problem, and that's sad." Trump's recognition of Jerusalem as Israel's capital in December outraged Palestinians, who said the United States could no longer serve as an honest broker in any peace process. A senior Hamas leader, Khalil Al-Hayya, said at a border encampment that Monday's protest was timed to coincide with the "deplorable crime of moving the U.S. Embassy to Jerusalem." A wounded Palestinian demonstrator is evacuated as others take cover from Israeli fire and tear gas during a protest against U.S. embassy move to Jerusalem and ahead of the 70th anniversary of Nakba, at the Israel-Gaza border in the southern Gaza Strip on May 14, 2018. "Every country has an obligation to defend its borders," he wrote on Twitter. "The Hamas terrorist organization declares it intends to destroy Israel and sends thousands to breach the border fence in order to achieve this goal. We will continue to act with determination to protect our sovereignty and citizens." In a small protest outside the White House, some protesters chanted "Palestine will be free." The Israeli military said in a statement: "Rioters hurled firebombs and explosive devices at the security fence and Israeli troops." The soldiers' response, it said, was in accordance with "standard operating procedures." The dead included at least six people under 18 years of age, including one girl. The total number of fatalities since a series of protests to demand Palestinians' right to return to their ancestral homes in Israel is now 103. An Israeli soldier carries a hose as he walks in a burning field on the Israeli side of the border fence between Israel and Gaza near kibbutz Mefalsim, Israel on May 14, 2018. Kushner said it was possible for both sides in the conflict to gain more than give in any peace deal. "Jerusalem must remain a city that brings people of all faiths together," he said in a speech. U.S. President Donald Trump walks on the south lawn of the White House in Washington, D.C., on May 14, 2018. But Palestinian President Mahmoud Abbas said the United States had opened an "American settlement outpost in East Jerusalem." He announced a general strike on Tuesday. 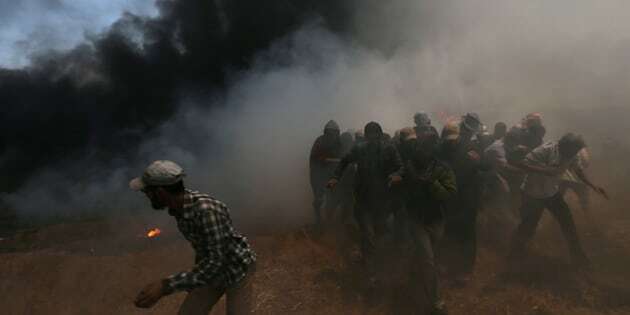 Palestinian demonstrators run for cover from Israeli fire and tear gas during a protest against U.S. embassy move to Jerusalem and ahead of the 70th anniversary of Nakba, at the Israel-Gaza border in the southern Gaza Strip on May 14, 2018. The United States on Monday blocked a Kuwait-drafted U.N. Security Council statement that would have expressed "outrage and sorrow at the killing of Palestinian civilians" and called for an independent and transparent investigation, U.N. diplomats said.